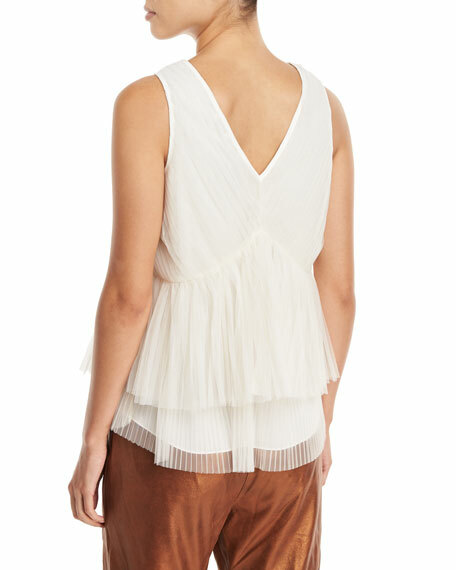 Brunello Cucinelli pleated silk top. Chiara Boni La Petite Robe "Clarisse" abstract floral-print top with flounce detail at right shoulder. One-shoulder neckline. Sleeveless. Fitted silhouette. Chiara Boni La Petite Robe "Clarisse" abstract floral-print top with flounce detail at right shoulder. One-shoulder neckline. Sleeveless. Fitted silhouette. Tall side slits. Straight hem. Nylon/spandex. Made in Italy. Josie Natori patterned voile blouse with grosgrain trim. Approx. 26"L from shoulder to hem. V-neckline. Long bishop sleeves; contrast cuffs. 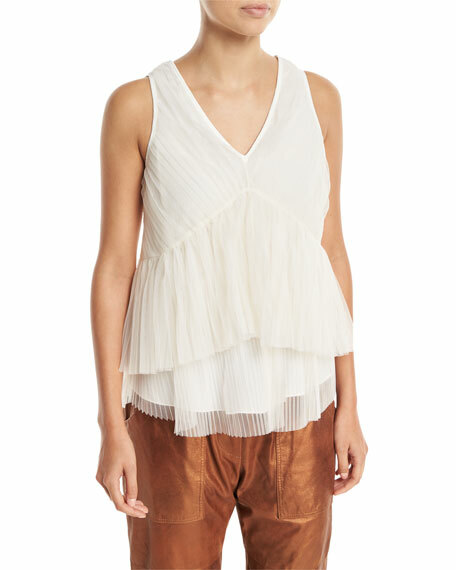 Josie Natori patterned voile blouse with grosgrain trim. Approx. 26"L from shoulder to hem. V-neckline. Long bishop sleeves; contrast cuffs. Relaxed silhouette. Straight hem. Pullover style. Polyester. Cotton lining. Imported. Model's measurements: Height 5'10"/177cm, bust 33"/84cm, waist 25.6"/65.2cm, hips 35.8"/91cm, dress size US 2-4/FR 34-36.